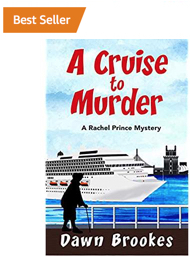 If you enjoy a good, clean murder mystery…..
…..join Rachel Prince, our new female sleuth, aboard the fictional Coral Queen and prepare yourself for a cruise to remember! Rachel is twenty-five years old, and appears to have everything. She is beautiful, bright and has recently qualified as a police woman. So why is she so sad? …..Her fiancé dumping her for another woman, might explain it! She needs rest and relaxation. Her best friend Sarah is a nurse on board a cruise ship, and offers the solution. Surely a Mediterranean cruise will help? When Rachel befriends an elderly woman in her eighties, the titled, Lady Marjorie Snellthorpe appears concerned about something. Danger and menace seem to be closing in on her….. Meanwhile, Rachel finds herself falling under the spell of the charming and attractive Carlos. Who is he and why is he so secretive? What could he be up to? One of the passengers meets with a tragic accident while onshore with Lady Snellthorpe, and the tension builds. With danger threatening at every turn, Rachel needs to get to the bottom of this mystery before someone else is killed. She is putting herself in danger. Could she be the next victim? This cozy/thriller has suspense and intrigue. A good, clean murder mystery with lots of red herrings. You don’t have to like cruising to enjoy this book but if you do you might get a double dollop of pleasure. Brilliant! Loved the medical insights on a cruise ship too. Best book I’ve read in a long time! Had to keep reading to see who the killer was. SeriesRachel returns to cruising after giving evidence in a difficult trial. She also wants to reevaluate her future after receiving threats from the man she helped put away. Crew aboard the fictional Coral Queen find themselves stretched to the limit by the antics of a Queen tribute act, a troublesome stag party and a group of excitable female cheerleaders. 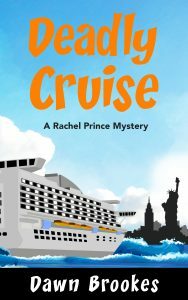 PC Rachel Prince, cruise ship sleuth is wondering if she will ever enjoy a peaceful voyage after a man dies under suspicious circumstances. Upon agreeing to accompany Lady Marjorie Snellthorpe on a cruise around the Baltics, the two women find themselves surrounded by an array of suspicious characters with ample motive for killing the unpopular victim. The man’s death is suspicious according to the chief of security, who wavers between involving Rachel in the investigation and keeping her away from it. 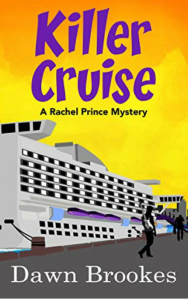 Sarah, Rachel’s best friend and cruise ship nurse is keen to keep her out of harms way, but it’s a case of the irresistible force meets the immovable object when there’s a mystery to be solved. Rachel is spurred on by the incorrigible Marjorie who is keen to interfere and test her own sleuthing skills. Chief Waverley and Sarah are fighting a losing battle, and become more and more exasperated by Rachel’s involvement, both having problems of their own. As the dead man appeared to have more enemies than friends, the mystery tests Rachel to the limit. She finds herself in danger as she tries to keep Lady Marjorie safe while solving the crime. Join the crew and passengers aboard the Coral Queen for another exciting adventure at sea!